The stem cell niche is a complex local signaling microenvironment that sustains stem cell activity in organ maintenance and regeneration. The mammary gland niche must support its associated stem cells while also responding to systemic hormonal regulation that triggers pubertal changes. 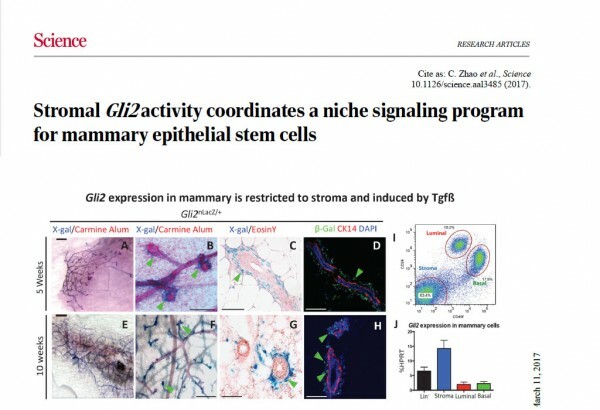 We find that Gli2, the major Hedgehog pathway transcriptional effector, acts within mouse mammary stromal cells to direct a hormone-responsive niche signaling program by activating expression of factors that regulate epithelial stem cells as well as receptors for the mammatrophic hormones estrogen and growth hormone. Whereas prior studies implicate stem cell defects in human disease, this work shows that niche dysfunction may also cause disease, with possible relevance for human disorders and in particular the breast growth pathogenesis associated with combined pituitary hormone deficiency (CPHD).